Performing Artists The BAMS Fest is now accepting performance applications for the BAMS Festival on June 22, 2019. The festival aims to promote, connect and celebrate Afro-centric culture, heritage, and contributions to the American fabric as expressed through art, music, food and entertainment with a global community. Learn more. Call to Artists Boston Cyberarts and the Massachusetts Convention Center Authority invite artists to submit proposals for the 26th round of Art on the Marquee at the Boston Convention and Exhibition Center. This 80-foot-tall Marquee offers more than 3,000 square feet of display area on 7 screens, providing full-motion video. We are looking for ten 30-second videos, animations or computer generated work, using the entire Marquee in colorful and creative ways. The Marquee is viewed by more than 100,000 pedestrians and motorists from 7am to 10pm daily. It is visible for half a mile in many directions, and is seen by traffic on Summer, D, and Congress Streets as well as from the surrounding hotels, office buildings and the Seaport World Trade Center. Artists are awarded $500 for selected videos. Eligibility is limited to artists and artist teams who reside in Massachusetts. Learn more. Choreographer Grants Through the New England Dance Fund, NEFA will award small, catalytic grants of $500 to $1,000 directly to choreographers who identify and articulate a critical opportunity that will significantly advance their career in dance. Eligible opportunities may include, but are not limited to: residencies; research trips; conferences; workshops or other trainings that build creative or administrative skills; tour planning; publication expenses; documentation; video shoots; artist fees needed to prepare the work for a pivotal presentation opportunity; hiring a consultant; mentorship. Learn more. Call to Artists ArtScape, WestConcord/Bradford Mill has announced a call for their upcoming exhibition, The Love Show. Learn more. Drop off: February 14, 2019 from 4:30-7:00 pm. Artist Residency Fellowships The Vermont Studio Center offers residency fellowships to open to ALL artists and writers living and working anywhere in the world. In addition, they will be awarding 14 open discipline-specific awards: 4 for writers, 4 for painters, 3 for poets, and 3 for visual artists. A number of fellowships with special eligibility requirements will also be awarded (many with stipends), including residency fellowships for artists and writers of color with demonstrable financial need; artists working in clay, fiber, glass, metal, and wood; 2D visual artists working in painting, drawing, or printmaking; socially-engaged teaching artists and more! Numerous generous merit-based partial funding grants will also be awarded. Learn more. Harborwalk Artist in Residence program Proposals Boston Harbor Now, the National Park Service (NPS), and the Department of Conservation and Recreation (DCR) have announced a call for proposals from artists whose practice will use the theme of Edges and Spaces Between as a point of departure to engage with the natural environment, community assets, activities, and history of Boston Harbor. Projects will be selected by a juried process. The Harbor is a place where land and water meet, and we are seeking projects that explore the richness of the stories that exist in the margins of physical space and in Boston’s social fabric and iconic historical sites. Learn more. MCLA Alumni Exhibition Call for Submissions MCLA Gallery 51 is has announced an opportunity for all their alumni to exhibit their work in a group exhibition highlighting their creative pursuits since graduation. It is a unique chance for the college to present the work of our alumni in our downtown gallery, highlighting the impact of an innovative liberal arts education and MCLA’s Alumni’s contribution to vibrant creative communities in North Adams and beyond. Learn more. Artists, Musicians Residency ACRE’s residency takes place every summer in rural Southwest Wisconsin. The residency facilities include numerous buildings which provide for expansive communal work spaces, a screen-printing studio, an outdoor wood shop, an art and tech facility, a sound studio, a fibers studio and a ceramics studio. Learn more. 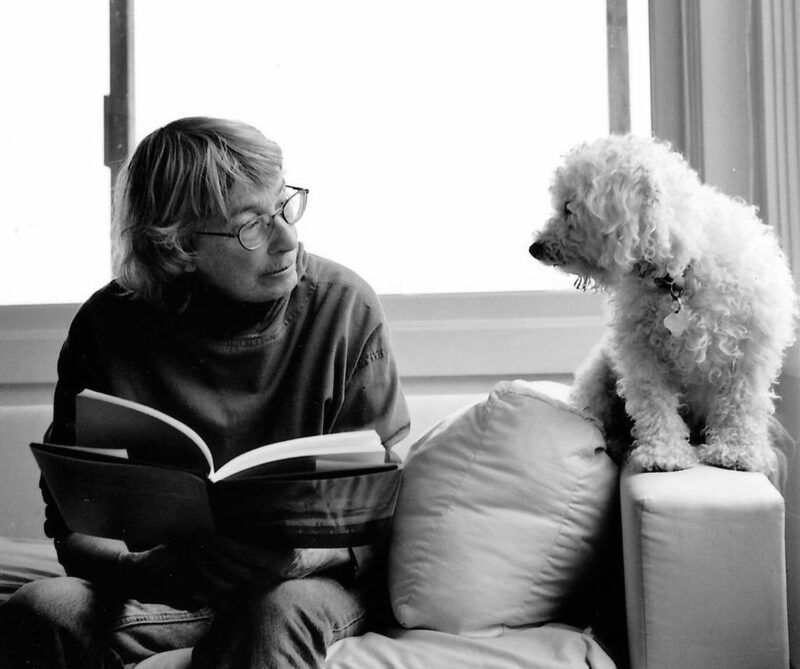 Image credit: The poet Mary Oliver and her dog sitting on a couch. Photograph by Rachel Brown.